Miami Cops have unmarked Altimas and laser guns. The RENNtech AMG C63 SPEC.R has a top speed of 187 MPH and luckily, sports a custom rear-view mirror-embedded radar/laser-detecting and jamming system. I used it, often. 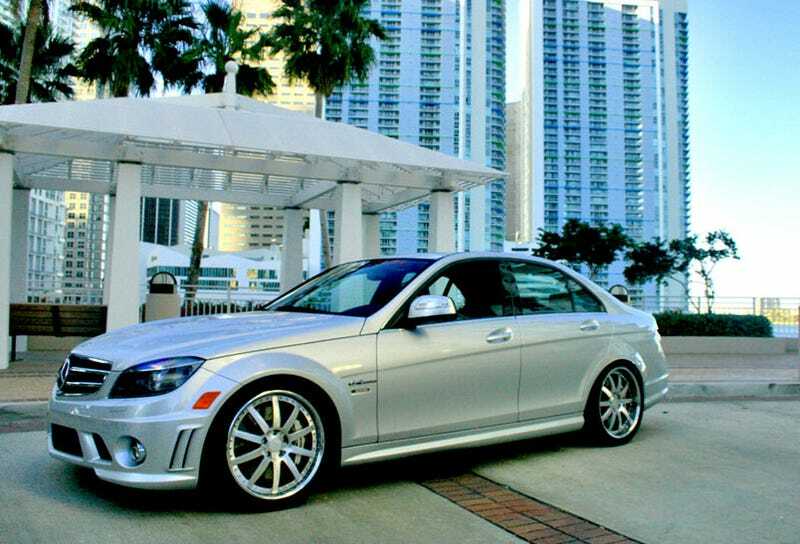 Three things about this particular C63 AMG. First, it's a rolling testbed for RENNtech, an established tuner of all things Mercedes, and has the prototype machined airbox to prove it. The second thing to know is power output's been pegged at over 580 HP, more than 100 HP over the stock AMG. There's a thick layer of expelled rubber on the rear fender to prove it. The third thing? It's still a Mercedes, and it has the luxury to prove it. Driving in Miami isn't about going fast, especially given the well-known congestion, rather, it's about looking stylish. Gleaming Bentley, Aston and Ferrari chrome is blindingly everywhere. They're almost as plentiful as police officers with their laser guns and unmarked Nissan Altima Coupes. So how do you avoid running into a squad car and landing in prison? This C63 was sporting a rear-view mirror embedded with the readout from the radar/laser detector (a Valentine One system), which gave direction and type of surveillance while looking like a stock compass readout. It's the original OEM mirror and all of the built-in features, such as day/night auto and garage openers, are fully functional. How did they do this? I spoke with Raymond Allen of Technicar, the company that designed the system. "It's stealth-mounted in the car so no one knows it is in the rearview mirror. Many cars have it so the compass will readout into the rearview mirror, so it looks like an OEM device but it gives you a stealth readout that no one knows its there." It works flawlessly. Speeding up an on-ramp, I hear the familiar chrip of the detector and quickly glance up at the mirror to see there's a car shooting us with laser from the rear at close range. We're going faster than the posted 45 MPH speed limit but no one gives chase. This is probably because the officer is getting an error message on the laser unit. The other trick piece on this car is the laser jammer. More authorities are switching over to laser because it's more precise and, of course, no one wants to put a radiation stick in their crotch all day, so having a laser jammer is a big lifesaver if you have a lead foot. When the cop shoots you with their gun it's typically sending out a few short beams of light and waiting to get them back in order to process the information and determine a speed. As soon as the sensors in the C63 sense the signal it automatically sends back the wrong data. For instance, if the laser gun sends five short beams of light at a car coming towards the officer, the car may send back three beams made to look is if the car is moving in the other direciton, thus causing an error. After battling the traffic, and the cops, I drive the car out to a more secluded part of Miami. As opposed to the danger represented by driving quickly on crowded streets, the greatest threat we face is O.J. Simpson, who owns a house not too far from where we go to stretch the car's legs out. Even without long stretches of open road it's clear this stealthy silver Benz can sprint. With the resonator delete, maybe stealthy isn't exactly the right word. There's a serious growl. And maybe the RENNtech logo splayed across the windshield and slicks on the back are a bit of a giveaway to the observant. But one moment you're at a stop sign and the next you're going 80 MPH. The company hasn't done official 0-60 testing yet, but with 465 Lb-Ft of torque, we imagine that figure is largely dependent on what kind of tires the car is wearing. Fitted with these slicks, getting the power down isn't too difficult. The rest is easy, too. It was surprising how effortless it was to throw the car around as we rocketed through the neighborhood and across on-ramps. The stiffer suspension, strut tower brace and lower stance contribute to a solid feel without sacrificing much in the way of comfort over the road... assuming you're willing to go over bumps at an angle. Traction control works, thankfully, keeping the C63 off of the grass when the wheels spin faster than the gears in the driver's brain, as I learned first hand. Given the performance on tap, it's surprising that this tuner version can retain most of the stock C-Class's civility. As this car is a mule, I'm not ready to pass judgment on the fit-and-finish. It looks good at a distance and, up close, any shortcomings are sort of endearing and show signs of serious use. RENNtech achieves a lot of gains through clever tuning of the car's ECU, which doesn't mean much until you see the rubber caked on the inside of the wheel well or hear it take off. Computer programmers FTW! Back in traffic, the car melts back into the Mercedes mold, the incessant beeping of the mirror being the only obvious giveaway. There's no need to sacrifice anything if you want to play Hyde by day and Jekyll by night. That's not completely true. You'll need to fork over an as-of-yet determined chunk of change. To further differentiate it from the lowly C63 AMG it's based on, a body kit is in the works. Nice as it might look with wider fenders, we think we prefer it the way it is, more sleeper than silly. As a work-in-progress this vehicle is still within the realm of gearheads, not the polished world of dentists who wanted to buy a toy with their dirty plaque money.